The King Koil Support Supreme Pillow Top 4' 6" Divan Bed incorporates a 2000 Coil Pocket Spring Unit with a Tri-ChiroTM System for targeted back Support, ChiroSpansTM which runs from Edge to Edge in the Critical Third Zone and Tuff EdgeTM Supports to keep the Mattress Shape. 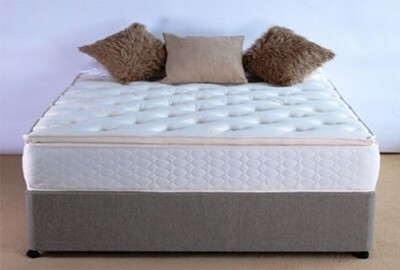 The King Koil Support Supreme Pillow Top 4' 6" Divan Bed is part of the King Koil Collection of Beds and Mattresses. Approved by the International Chiropractors Association this Luxury 2000 Pocket Sprung Divan Bed provides Enhanced Spinal Care and unrivalled Posture Support. This model features Tri-ChiroTM System for Targeted Back Support as well as Chirospan Technology in the centre third and a Posture PadTM Zonal Layer to support the spine in a Healthy Alignment. The King Koil Support Supreme Pillow Top 4' 6" Divan Bed has Tuff EdgeTM Supports to keep the mattress shape and is conveniently Non-Turn. Finished with a Pinched Pillow Top Design and a Stretch Knit Fabric for added comfort, this luxury pillow top bed is complete with a 10 Year Guarantee. The luxury Divan Bed comes with Free Delivery and Free Collection & Recycling Of Your Old Bed throughout our Free Delivery Zone (Northern Ireland and Counties Monaghan, Louth and Dublin).